Aga Khan Road, Shalimar 5,P.O.Box No.1251 Islamabad. The Marriott Islamabad is situated at the foot steps of Margalla hills, and is close to Rawal Lake & the town centre, President & Prime Minister's House, Foreign Missions, World Bank, and Government Offices. Choice of smoking and non-smoking rooms, suites and executive level rooms equipped with modem ports. The Health Club offers separate gyms for ladies and gents , sauna and steam bath, all-weather swimming pool. There is a round-the-clock Business Centre, as well as 32000 square feet of banquet facilities that can cater to the needs of 15 to 1500 people. 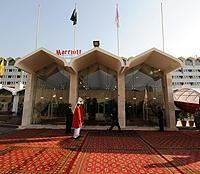 Marriott Hotel Islamabad in Islamabad, offers above rates only to Hunza tours. The online reservation payment must be made to Hunza tours not the hotel. Book your events, Meetings, Conferences Marriage parties at Marriott Hotel Islamabad or any other hotel in Islamabad please feel free to email us we will offer you the best possible rates and perfect arrangements to suit your events. Islamabad Marriott hotel is 2nd best hotel in Islamabad. 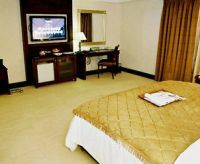 The Marriott Islamabad is a 5 star hotel located in the heart of the capital city. Being in close proximity, President & Prime Minister Houses, Ministry of Foreign Affairs, Senate, Parliament House, Foreign Missions, World Bank, Government Offices, corporate sector, Print and Electronic media offices etc it is has been renovated and made into fortress of Security. For room reservations at Marriott Hotel Islamabad Islamabad please contact usTravel & Culture Services are hotel reservation agents in Pakistan. We reserve hotels at special discounted rates for individuals and companies. Islamabad Marriott Hotel outside catering department resumes. A heart wrenching 20th September incident in Islamabad Marriott Hotel, a home for all in Islamabad, the colossal incident have totally disturbed hotel operations but rehabilitation and reconstruction work is in quick process and the hotel will be up and running soon in the near future. However, management of the Islamabad Marriott Hotel is pleased to inform you that we have resumed outdoor catering and we are fully equipped to take any function for up to 5000 persons at client�s location as hotel entire catering plant is now fully functional. Once again the Management of Islamabad Marriott Hotel expresses deep gratitude to its worthy customers. The hotel management will work diligently to overcome all such challenges and keep the flag of Pakistan hoisted high. We are looking day and night to restore the hotel; it will be fully operational in near future. For further details please contact us Travel & Culture Services are hotel reservation agents in Pakistan. We reserve hotels at special discounted rates for individuals and companies. Update: 21st September 2008 on the evening of 20th September 2008 Islamabad Marriott hotel was hit with the biggest ever explosion in the history of Pakistan. A truck loaded with 1000 Kilograms of explosive drove forcibly in the hotel and exploded the building resulting fire and left over 60 innocent people martyred. A Question : How do these people get such explosive material who sells it to them? ? ? ?